California, with its every-changing seas and rugged mountains, has long attracted plein aire painters. A movement of landscape painters known as The Oak Group has done more than chronicle our state’s beauty; their works bring attention to the need for preservation of our open spaces. Chief among these artists is Richard Schloss, a master of the genre who is known for his impressive treatment of light. Richard earned his MFA in Fine Arts in 1979 and BA in Italian in 1981 from UC Santa Barbara. He remained in Santa Barbara for many years before relocating to Marin County. 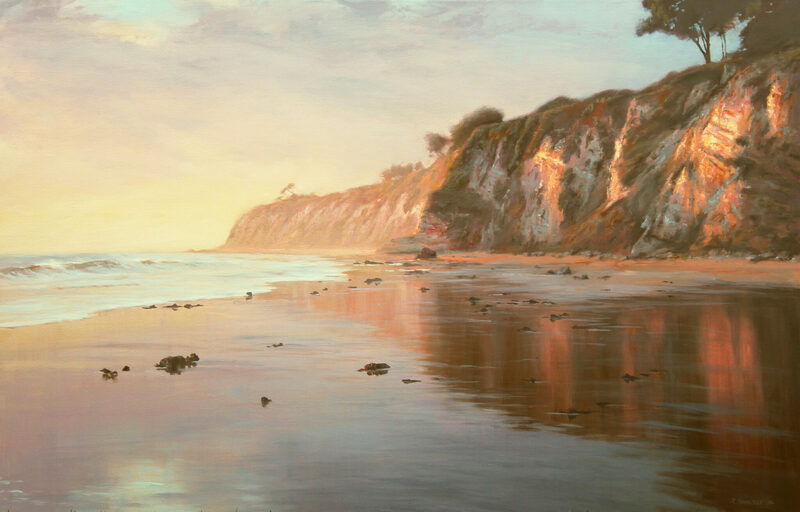 In 2015, The Museum of Ventura County had an exhibition of Richard’s paintings and wrote: His exceptional and dramatic treatment of light creates and captures a moment in time that evokes memories of an unspoiled California. His paintings, now usually created on large canvases and in his studio, often reflect the deep shadows and ephemeral nature of mist and water-splashed coastlines. Schloss’ documentation was in 2015 and sponsored by Pat and Dave Herman. The AfterGlow was hosted by James and Mary Galbraith.